They were forced to withstand a late onslaught at Páirc Naomh Uinsionn, but Dublin eventually secured a three-point triumph in the Dublin Bus/Herald Dubs Stars Football challenge. Brought forward because of the early start to the new GAA inter-county season, this annual fixture between the All-Ireland champions and the Dubs Stars served up another entertaining encounter. Colm Basquel was a lively performer during the opening period and thanks to a brace of goals by Aaron Byrne (the U-21 Footballer of the Year for 2017) Dublin entered the interval with a 2-8 to 0-8 cushion. Seven points in succession after the restart helped the county men to open the floodgates and, even though the Stars fired back with goals from Jason Whelan and Pat Burke, they ultimately fell short in their bid to mount a dramatic comeback. 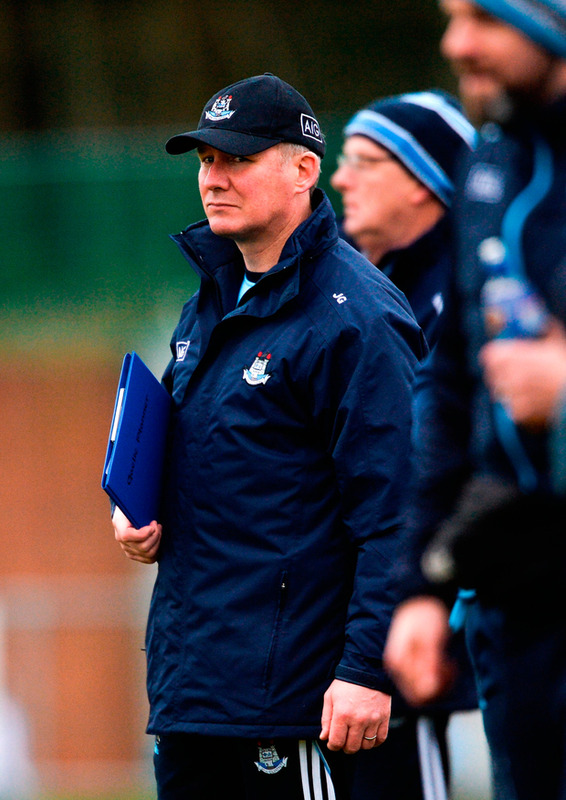 Dublin boss Jim Gavin was on the sideline for this game, but 12 months on from guiding the county to O'Byrne Cup glory, Paul Clarke will once again be in the charge for the pre-season competition. The performance of Byrne was a major plus point for the Whitehall Colmcille man, and he also saw positives in the displays of Basquel and Killian O'Gara. "Aaron is a very fine footballer. It's again a great plus to have him on board. His skill levels are really high, he's very comfortable on the ball, he travels at pace. "He doesn't look like he's moving well, but he's flying by guys," Clarke remarked after the game. "Colm is a great footballer. Great to have him around. Killian, we would have looked at him at the latter part of last year's competition. It'd be nice to have him around, because he gives you a great dimension. He's a very physical sort of player with nice skill levels." Though his son Nathan was unavailable on the day, Stars supremo Brian Mullins was able to call upon a number of his Vincent's charges. Former county stars Michael Savage, Ger Brennan and Tomás Quinn were included in the starting line-up, and there were also places for Craig Wilson and Jarlath Curley in defence. Indeed, after Cork footballer Niall Coakley had broken the deadlock, Quinn pointed a routine free to double the Stars' lead. The ace Vinnies marksman later cancelled out a score by Naomh Mearnóg's Shane Carthy, before Dublin levelled matters through Emmett Ó Conghaile and Adam Rogers. Stars gathered momentum with subsequent contributions by Oisin Kelly, Quinn and Coakley, but as the half progressed, the Dublin attack came into their own and Basquel split the posts in style from a right-hand angle. Full-forward O'Gara (younger brother of Eoghan) was providing a direct outlet on the edge of the square, and he set up Byrne for a terrific 20th-minute finish into the bottom left-hand corner of the Stars' net. Gerry Seaver added a point from the left wing, before O'Gara once again released Byrne for a clinical major. This allowed Dublin to take control, and although Kelly and Coakley (free) found the target for Stars, Basquel (two) and Rogers ensured that their opponents remained in the driving seat. Rogers and industrious St Brigid's forward Mal Tighe traded scores after the break, but within the space of nine minutes, Dublin had developed a seemingly unassailable lead. O'Gara and Byrne singles were followed by a brace of points from the increasingly-influential Basquel, while Colin Doyle, Rogers and substitute Ryan Deegan also hit form. This left the Stars 13 points in arrears (2-16 to 0-9), but a superb goal on the run by centre-forward Whelan did offer them a glimmer of hope. Glen O'Reilly and Doyle helped to reinforce Dublin's superiority with well-worked scores but, inspired by inside forward Burke, the Stars found an extra gear in the closing quarter. They will now move forward to an O'Byrne Cup clash against Offaly on January 3 at Parnell Park. Scorers - Dublin: A Byrne 2-1, C Basquel 0-5 (1f), A Rogers 0-4, C Doyle 0-2, S Carthy (f), G O'Reilly (f), G Seaver, E O Conghaile, K O'Gara, R Deegan 0-1 each. Dubs Stars: P Burke 1-2 (0-1f), J Whelan 1-1, T Quinn 0-4 (3f), N Coakley 0-3 (1f), O Kelly, M Tighe 0-2 each, F Duffy 0-1. DUBLIN: A Bunyan; R McGowan, S McMahon, G Hannigan; D Devereux, B Howard, G Seaver; S Ryan, S Carthy; C Basquel, E O Conghaile, K Callaghan; A Byrne, K O'Gara, A Rogers. Subs: D Downey, R Deegan, C Doyle, E O'Brien, C Sallier, G O'Reilly. DUBS STARS: M Savage; C Wilson, J Curley (all St Vincent's), M Fitzsimons (Cuala); C Keeley (Ballymun Kickhams), G Brennan (St Vincent's), O Kelly (Thomas Davis); A Elliott (Ballymun Kickhams), R Downey (Ballyboughal); M Sweeney (St Jude's), J Whelan (Ballymun Kickhams), K Doherty (St Jude's); P Burke (Kilmacud Crokes), N Coakley (St Jude's), T Quinn (St Vincent's). Subs: JB Carthy (St Jude's), D Kennedy (Na Fianna), M Tighe (St Brigid's), F Duffy (Ballinteer St John's), E O'Connell (Scoil Uí Chonaill), D McGuinness (Nh Maur). Ref - D O'Connor (Fingal Ravens).